Interview with my husband, Kevin, and me, chatting about how to go keto by yourself, how to react to family members who voice concerns about keto, inviting your partner into keto, and so much more. Going keto alone can be quite the challenge, but when you live with non-keto people, it’s a pretty daunting task. Between carbs in the house, trying to respect other people’s food preferences, and just wanting the best for those you love … how can you coexist with your carb companions and not get distracted from the keto path? The Keto Diet Podcast is almost a year and a half old, and I’ve never had my husband, Kevin on the show. We decided to fix that this week and answer your questions about how to go keto with a non-keto partner. I had a blast recording with Kevin — we even went live on Facebook! I think he did a pretty great job for his podcast debut, and our furry babies made an appearance as well. Kevin and I are sharing our keto journey — how I started, what he thought, and my strategy for getting him on board. Hint: it’s not as complicated as you’d think. We’re also unboxing my second EVER Thrive Market order and sharing our (unfiltered) first impressions. In today’s podcast, I chat with Kevin, my husband, business partner, keto copilot, reformed carb lover, tech wiz, coder, developer, and fellow entrepreneur. This episode is all about how to do keto alone, how to convert family members to keto, what a shared keto life looks like, and more. 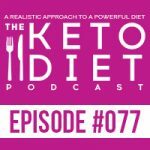 Leanne Vogel: You’re listening to Episode Number 77 of the Keto Diet Podcast. Today we’re chatting about how to go keto by yourself, how to react to family members who voice concerns with your keto choices, and inviting your partner into the mix without creating a lot of tension at home. Stay tuned. Hey, guys. Happy Sunday, March 18th. I can’t even believe where time is going right now, it’s crazy! The show notes and full transcript for today’s episode can be found at HeathfulPursuit.com/Podcast/E77, and let’s hear from one of our awesome partners. Okay. I got two awesome announcements for you guys today. The first is that you’ve asked me for years to come up with a list of my favorite keto things, and it was a lot of work, but I did it. You can find it over at HealthfulPursuit.com/Favorites, where you can get many of the epic descriptions, recipes, videos, and other fun things of all of my favorite products. It probably took us about six months at least to put together this resource, and every single product that I love is on there. When you click on those products, it’ll give you videos, and pictures, and resources that are already on Healthful Pursuit or new ones we created that show you how to use those products, because we get a lot of questions about just food in general and products that I love. Now it’s all in one place. Again, that’s HealthfulPursuit.com/Favorites. The second thing, this is really fun, we’re actually recording this podcast live, again, on Facebook Live, and we’re going to be doing a Thrive Market unboxing. We have no idea … Well, I have an idea what’s in the box, because we had to coordinate it, but Kevin has no idea, our guest today, who I’m going to be introducing in a second, has no idea what’s in the box. Later on, we’re going to be doing the unboxing, going through all the awesome keto things that we got in our box. This is actually the second time ever that we’ve gotten Thrive Market, so I’m pretty excited to eat all of the things. I’ll include a link today in the show notes where you can sign up to get $20 off your first three purchases, for a total of $60 in savings, plus free shipping and a one month free trial membership. You can find that at ThriveMarket.com/Keto, and I’ll also include that in the show notes. Today’s guest, and I don’t often let them speak before I do their bio, but I’m going to today, is my husband, Kevin. Say hi, Kevin. Kevin Kraft: What’s up? Hi. Leanne Vogel: This is the first time that he’s been on the show, and I’m really excited to have him here. I wrote out a bio for him, because he always makes me really nervous, and I’m just like, “This is my husband, Kevin. He’s really awesome. You should be his friend,” but here it goes. Kevin Kraft: You did well. Leanne Vogel: Thank you. I didn’t even screw up once, I don’t think. I black out when I read. I don’t even know what happened. 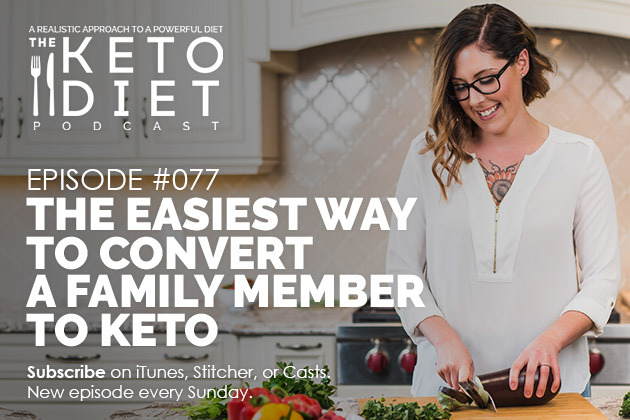 Today we’re going to be chatting all about the easiest way to convert a family member to keto and kind of our experience back in 2014, when I started the ketogenic diet from being basically vegan at that point. I mean, it was a long time ago. It’s hard to remember kind of the space that I was in, but we wanted to kind of go through what that transition was like for us as a couple, what that was like when I went keto, and then fast forward a couple years, when Kevin finally went keto with me. Yeah. Any thoughts on that first, before we dive in? Kevin Kraft: The only thing is, like all the other diets before the keto diet were more experiments, like trying to figure out what makes you feel better and what doesn’t, right? Until keto, there wasn’t really any sort of much research. There was not much research trying to figure out what does the diet do? How does it work? Why does it make me feel better? Why does it not make me feel better? Leanne Vogel: Like research on my behalf, like of my diet. Kevin Kraft: Yeah. It was just like, “Hey. Everybody else is doing …”, or, “There’s this thing out there that everybody else is doing or maybe has been doing. I want to try, too and see how it makes me feel.” Then along came keto, and it was like, “Whoa. There’s this thing that’s science based and makes …” It made more sense, more logic. That was kind of the step, right? Leanne Vogel: Yeah. I think you’re totally right. It was interesting, because this kind of came at the point where my hormones were really messed up, and I needed to do something. Then it was sort of like up until that point I didn’t need to do research. I was nutritionally trained, and I learned certain things in that school that now they teach different things, but at that time it was very wrong for my body, but I never even knew about low carb diets of ketogenic diets, like it wasn’t even an option. Kevin Kraft: You had heard of Atkins. That’s about it. Leanne Vogel: Oh. Atkins. Yeah. Kevin Kraft: That’s about it, right? That was the closest there was a somewhat science based diet? Leanne Vogel: Yeah. Kevin’s really big, if you noticed yet, that keto is basically the only diet with actual science. He gets really into it. Leanne Vogel: It’s so true. Yeah. I mean, it’s so true. I’m sure we’re going to go through that more in the episode. The first piece that you guys had and really the questions you had around our experience going keto was … My experience, first off, is how did Kevin react when I went keto? Kevin Kraft: I don’t think I “cared.” It’s a journey, right? I think you have to follow what your body lets you experience. If your body rebels against you when you try something, then you know that it’s probably not the right thing to do. I think the only reaction someone should have is try to be supportive, and also, let’s see what happens, because if a reaction of someone else around you, if my reaction would have been, “Whoa. You should stop doing that,” that’s not fair. I didn’t even know what was going to happen, how you were going to feel after. Leanne Vogel: Yeah. Kevin’s super supportive, so I think for you it’s like, well, if it makes you happy … Initially, I don’t think you were concerned, but fast forward like three months when I had lost a ton of weight, and I wasn’t eating a lot, and I was counting everything. Were you concerned then? Kevin Kraft: No. I don’t think so, because you’ve got to remember that I saw the entire process from the outside, and I also saw all the research that you were doing and trying to figure out why certain things are happening. Me being somewhat a logic… like I try to put logical things, like trying to explain things logically, and that’s what you were doing too, so no. I don’t think I was concerned at all. Also, it’s not like you stopped somewhere. It’s not like you went to a certain place where you lost a lot of weight, and you weren’t feeling good or whatever, and then stopped there. You’re like, “No. No. No. I’m not going to stop. I’m going to continue trying to figure this out,” so there was no concern there really. Leanne Vogel: I didn’t know that. I thought for sure you were concerned when I was really, really low in weight, and I started obsessing about calories, and I wasn’t sleeping. Kevin Kraft: No. It’s a journey. Leanne Vogel: Amazing. Yeah. I think you’re right. I remember when I was probably seven months into keto and I started having all those issues. We spent a week drinking wine and reading books up in the mountains at my parents house, trying to figure out, okay. What’s the next step? Let’s not give up. Let’s keeping moving forward and figuring it out. Kevin’s always been really supportive, but at that time you weren’t eating keto. You were eating Kevin way, just a lot of meat, a lot of bread. He really ate a lot of bread, didn’t you, like those buns we used to make, like the kabocha buns? I don’t even remember what you used to eat. Do you? A lot of meat. Kevin Kraft: Well, I think was it hard for you to do keto alone? It’s like, yeah. In a way, because you still have to feed me, because I don’t know how to operate the kitchen. Leanne Vogel: Kevin is really bad at cooking. I wouldn’t even say really bad. You just don’t do it, like you can’t do it. Kevin Kraft: I think it’s a danger to society. Leanne Vogel: You know what? I didn’t find the cooking thing challenging. Did you think that I did? Because I’ve never found it that challenging. Kevin Kraft: No. No, but I think it was extra work, right? You always had the two things going and the two thought processes going. One is, well, how do I make my meal keto, and then what do I make Kevin that’s similar, right? Leanne Vogel: Yeah. It’s interesting that you say that. I think a lot of people struggle with that. For me, it’s sort of like, okay, well, we both eat meat, so I’ll make a meat. Then Kevin doesn’t eat a lot of fat, so I won’t make his meat with a ton of fat. I’ll just put fat on mine, and then I’ll put avocado on mine and have greens with mine. Then I’ll make pasta for Kevin. It was just that trading of where I have fat, he has carbs, and then you just switch it out. I think a lot of people think it’s more complicated than it needs to be maybe. Kevin Kraft: Maybe I remember it differently, but that’s okay. Kevin Kraft: Also, I think you couldn’t really push it on me at the time, when you first started, because you were still learning so much about it yourself. I think what you’ve always, always embraced is that a woman’s body is different than a man’s body, and you were really focused on trying to figure out how do hormones work on a ketogenic diet and all those things. Maybe now you would be in a place where you’re like, “No. No. No. I really understand keto inside and out. I can push it on you, because I actually understand it fully, even for how it works in a man’s body,” but I think at the time there you were really trying to figure out … Also, taking in all the feedback you were getting from the community on how it works for women. Leanne Vogel: Yeah. You’re so smart. The next question that you guys had was did I set any rules for foods that I didn’t want Kevin to keep in the house? I’ve never done that, have I? Kevin Kraft: No. I don’t think so. Leanne Vogel: Yeah. You were really mindful. You always said like, “Is it okay that I eat this in front of you?” If you ordered pizza, I would go upstairs and just not be part of that, especially when I first got started. It was harder for me just to be around that. It was fine for me to make the decision every day, but just subjecting myself to that was hard, and you were always really mindful of it, but I never made any rules of have this, don’t have this. That would be nuts. I couldn’t do that. Can you recall any conversations about keto? Did you try to talk to Kevin about it? Well, we talked about it all the time, just of like, “Oh my gosh. I just learned this new thing. What do you think about this?”, that sort of stuff. Hey? Kevin Kraft: Yeah. I don’t think there was ever a conversation like a, “And this is how keto works, and you should be eating keto, because of such and such.” I think it was just, “Hey. I learned this. I learned that. Did you know about this?” Then I would ask you questions, being like, “What about this? What about that?” I don’t think there was ever that one conversation where you tried to push it on me, and I don’t think that works anyway, because I think a person has to make their own decisions. Leanne Vogel: I can see how it’s really frustrating. We meet people every day. We are constantly meeting new people, talking to new people. Nine times out of ten, health comes up and diet comes up, and because I know things about the ketogenic diet and benefits of the ketogenic diet, it can be really frustrating to sit there and just bite my tongue, and not saying anything, but I think at the end of the day, sometimes I just mention, “Have you heard of the ketogenic diet?”, and they’re like, “No. What’s that?” Then I explain it, but if they’re like, “Oh yeah. That’s really bad for you,” I kind of shut it down. It’s the same thing with anyone. It’s like even though I know all of the benefits and I know that somebody could probably be helped by those things, me pushing it on them isn’t going to help. Generally, if they’re a fun person, and they’re like, “Yeah. Tell me more about it,” I tell them a little bit, and then I say, “I know of a book that’s really great. It’s by a lady named Leanne Vogel, and it’s called The Keto Diet. You could maybe pick that up,” and kind of take it that way, because I don’t think pushing ever helps. I know pushing never helps, and that will just create a divide in your relationship, or your friends, or even just strangers that you meet on the street. Was I ever worried about Kevin eating carbs while eating keto foods? You didn’t really eat keto foods while you were eating carbs. I just lowered the fat in your meal. Even if you chose tomorrow to start eating carbs again, I would just lower your fat, but still give you fat, because fat is so helpful. Kevin Kraft: I think, again, we’re talking about good fats, and I’m not sure, Leanne. I know obviously eating carbs … I mean, this is my opinion. Eating carbs is not that good for you. It’s just not good for your body. Everything I’ve learned about eating carbohydrates and what happens with them, it’s not a good situation, but I think if you need to eat carbs and you eat the good food, good meats, and good fats, with it, obviously it might not be as good as just being keto or eating a very small amount of carbs, but I think it’d still be better than maybe what I was eating before that, right, like any sort of processed meats and more garbage meats, more garbage fats, as opposed to the good fats. I don’t know. Mayo, for example, right? Kevin Kraft: Wait. Wait. Wait. That was only because they looked really healthy, and it said it was healthy on the outside too. Leanne Vogel: I think it’s called Healthy Selections or something, and it’s a meal for four people, but he would put it in a casserole dish, and heat it up in the microwave, and that would be the only meal he would eat all day. I remember watching you eat it for the first time. We were just dating. Then you got all phlegmy. I was like, “Dude, I think you’re allergic to that.” You’re like, “What?” I’m like, “Yeah. There seems to be a lot of dairy in that. Are you allergic to dairy?” You’re like, “What’s dairy? What do you mean?” We switched him to a dairy-free eating style, like the next day we went to Safeway, and we got a bunch of stuff. Kevin Kraft: Yeah, but I was also having cereal. Cereal at the time was a big deal, right? Then you got me going on I think almond milk, because the rice milk … I don’t think we ever did any rice milk. It was almond milk first. Leanne Vogel: Yeah, because of the arsenic in rice milk. That stuff is no good. Now we’re getting to the part in the show where we’re going to do a Thrive Market unboxing. I’m pretty excited about it. The box is right there. Like I said earlier, we got this box. It’s our second box. I’m pretty excited for the treats inside, and we’ll be unboxing it together. Kevin, do you want to grab it for me. Kevin Kraft: Yeah, but tell me, what’s this Thrive Market business all about? How does their business work? You subscribe to it, and then you get it? Leanne Vogel: Yeah. Well, you get a membership. It’s almost like Costco, but it has healthier things, and you can actually find avocado oil mayo, because you know how like no Costco has avocado oil mayo? That needs to change right now. Kevin Kraft: Obviously, not all. At some Costcos, yes. Leanne Vogel: Most. Basically, you get a membership, and then any time you want groceries you just go online, and then you pick your groceries. They have a keto section now that’s being added to every day. Then you just pick all your groceries. Then you put it in your cart. Then you say yes. Then if you use our link … What is it? ThriveMarket.com/Keto, then they get $20 off their first three orders. You add all this stuff to your cart. You get a wicked discount. Remember that video we did for our first unboxing? It was crazy the discount between Amazon and Thrive. It was way cheaper with Thrive. Kevin Kraft: I guess all the foods that are there are generally high quality foods then? Leanne Vogel: Yeah. Higher quality. It’s like the stuff you would find at Whole Foods. Of course, even with Whole Foods, there’s stuff that has like sunflower seed oil that I wouldn’t really recommend and things like that, but the selection of awesome choices that I approve, that you love, that keto people love are there. Kevin Kraft: You’re saying back when we first met, when I kept on going to get those frozen meals, Thrive Market would have probably saved me? It would have been a better deal? Leanne Vogel: Yeah. You were spending so much money on those meals. Kevin Kraft: Yeah. Well, they looked healthy. Leanne Vogel: But you have to be able to cook a little bit I think. Dun, dun, dun. Kevin is going to grab the box, and we are going to unbox it together. I don’t totally know how this is going to work. Kevin Kraft: Does the box show up on microphone? Oh, wait. Leanne Vogel: Okay. Let’s figure this out. Kevin Kraft: It’s okay. It’s okay. We’re good. Leanne Vogel: Okay. I’ll let you do the unboxing, and I have a list of the products that are in there, so I know how much it costs and all the things. Kevin Kraft: Okay. Wait. I got a white tub of stuff. It says collagen peptides. It’s grass fed. Well, it’s right by Thrive Market, so they make products too. Leanne Vogel: Yeah. Yeah. They have their own products, and they’re way cheaper. Kevin Kraft: Oh. That’s cool. What do I do now? Do I look through it? Leanne Vogel: Well, look. Yeah. Kevin Kraft: It looks like a really nice container. Leanne Vogel: It is. I really like that it’s in a plastic container, even though I don’t totally love plastic, because the bags of collagen are super hard to work, and they always get stuck. You know? They’re not able to seal again. This is a number two plastic, so you can recycle it. Kevin Kraft: Yeah. It’s good packaging. Leanne Vogel: I’ve never tried this Thrive Market collagen before. Kevin Kraft: So, a really stupid question here, but I guess what are the ingredients, or is collagen just collagen? Leanne Vogel: It should just be collagen, but the ingredients should be right here. Yeah. So, it’s just collagen. Leanne Vogel: Yeah. There you go. Kevin Kraft: Can I try it? Leanne Vogel: So, no flavors or anything. It’s just regular collagen. Kevin Kraft: So, this whole non-GMO and … Can collagen be organic, or is that a silly question to ask? Because I think it has come up before, hasn’t it? Leanne Vogel: Man. See, these are the questions Kevin asks me at home, and then I have to do a bunch of research, because I legit don’t know. I would say in the case of collagen … Now, this is just off the top of my head, so it could be wrong. … is I don’t know if I would care so much if it’s organic or non-GMO, just because I would care more about pasture raised, grass fed, grass finished, but good luck finding grass finished collagen. If you find one, let me know. But I would say in the grand scheme of things … So, this tub is how many …? What size? 20 ounces, and it was … Where do you see it on here? $24 for 20 ounces. Leanne Vogel: Sorry. I’m really bad with money. Yeah. There you go. Okay. Next. Kevin Kraft: Okay. It’s a bag. Oh. It’s jerky bites. Leanne Vogel: Pebbles. Pebs, come here. Kevin Kraft: Why doesn’t Lexy get some? Kevin Kraft: Well, should I not review these first? Leanne Vogel: I love you. Well, how are you going to review it? Kevin Kraft: Well, I’m not going to eat it. Why don’t we look through ingredients first? Leanne Vogel: They actually smell really good. Okay. Kevin Kraft: Oh. Look at this. No fillers. No animal byproducts. No artificial preservatives, flavors, or colors. No corn, wheat, or rice. That’s pretty much in all dog foods. Leanne Vogel: Do you want to give me a piece, and we can …? Oh. She’s sick right now. Here you go, Pebbles. Oh, yay! Dog approved. She likes. Kevin Kraft: Ah. Yeah. She does. Leanne Vogel: She’s like, “Where’s the rest?” Oh. I just got snot on my face. Leanne Vogel: Yeah. She did. Yeah. Nicely done. Here. Leanne Vogel: Can you put her down? Kevin Kraft: That’s really cool that there is no garbage food, even in the dog food. Leanne Vogel: Yeah. I really like their treats and things. We got beef strips last time, and they really liked them. Kevin Kraft: Okay. What it this? It looks like coconut chips. Coconut, our dog, is actually not here right now, so otherwise, it’d be a big problem. Leanne Vogel: Yeah. It would be a huge problem. Kevin Kraft: But, so, these are what, organic coconut chips? Leanne Vogel: Read the ingredients. Do the things and the stuff. Kevin Kraft: Oh yeah. Let me see here. I was going to call myself Dr. Kevin. Clearly I’m not, but I’m going to look into this, as if I was a doctor. Coconut flour, cassava starch, coconut oil, xanthan gum, kosher salt, and pink Himalayan rock salt, right? Leanne Vogel: Yeah. These chips are amazing. They are amazing. They’re for a carb up, because there’s cassava starch. Kevin Kraft: Yeah. I see. Yeah. Okay. Whoa. 17 grams of carbs. Leanne Vogel: Carbs. Yeah, but look. But, look. Hey. Just one second. A serving size is 10 chips, and there’s 17 grams of carbs, but 5 grams of fiber. Leanne Vogel: Just 12 grams of net carbs. I mean, that’s pretty good for carb up. Kevin Kraft: True. Yes. And you said carb up. True. Leanne Vogel: Yes. I did say carb up. Kevin Kraft: Kevin would be like, “Whoa. What is this?”, and he would put it back, even though they taste really great. Leanne Vogel: They’re really tasty. We had them in Vegas for the first time. They were really good. Yeah. They’re really good. Kevin Kraft: Oh. Look. We like this company, Manitoba Harvest. Leanne Vogel: Hopefully you guys don’t hear Pebbles. I mean, we’re recording this live, and we’re not going to stop, so that’s our dog. She’s sick. That’s life. Kevin Kraft: All right. Toasted hemp seeds, sea salt. The ingredients are toasted hemp seed and sea salt. Leanne Vogel: These are good. I don’t like eating them like a snack. Kevin Kraft: No. They’re good on a salad. Kevin Kraft: Yeah. I like those. Leanne Vogel: I guess if you ate yogurt, it might be good on yogurt too. Kevin Kraft: It looks like the package is resealable too, which is nice. Leanne Vogel: Yeah. It is. Yeah. Totally. It is. The first time I had hemp hearts with shells on them it was in the UK. Kevin Kraft: Somebody sent us alcohol. No. I’m just kidding. We don’t drink alcohol. Kevin Kraft: I was really excited about this, but I don’t think I will be. Here’s this bag. Okay. There’s a lot of wrapping here, because they ship this stuff, so I guess they got to protect it. It’s organic apple cider vinegar. I don’t think I should be drinking this out of the bottle. Leanne Vogel: You could try. Oh, you should totally try. Kevin Kraft: No. It tastes horrible. We tried this before. Leanne Vogel: I don’t mind it. Oh. Cool. They have recipes on it. Tummy taming tonic. Okay. One teaspoon of apple cider vinegar and one teaspoon of honey. Kevin Kraft: I don’t like any of that. I like the other one, household degreaser. Leanne Vogel: Oh. That’s smart. I hadn’t even thought of using apple cider vinegar to clean. I use white vinegar. Kevin Kraft: Ingredients are unfiltered, organic apple cider vinegar. Leanne Vogel: And water. There you have it. Kevin Kraft: Water, and it’s 5% acidity. Leanne Vogel: Acidity. Okay. Next. Sorry, Pebbles. Oh, no. Kevin Kraft: Oh. Yay. We eat this by the spoon. I’m just kidding. It’s chocolate chips. Lily’s dark chocolate chips. You use those for baking, right? Leanne Vogel: Yeah. All the time. Any time there’s chocolate chips in stuff. Kevin Kraft: Let’s see about the carbohydrates. Where are you? 9 grams. That’s way too much. Leanne Vogel: Well, no. It counts the erythritol, so you got to take that away, babe. Kevin Kraft: Well, I guess. See, that’s why I count on Leanne. Kevin Kraft: That’s why it’s not that easy to look at the back of these. Look at that. Kevin Kraft: Yeah. That’s a good idea. Why don’t you try it first and see what happens? Kevin Kraft: Oh. Oh. Maybe not. Are these noodles? Leanne Vogel: Yeah. They are. Kevin Kraft: They look like … Oh no. They’re a Thrive Market product. Leanne Vogel: They’re Thrive Market noodles. Kevin Kraft: Gluten free wonder noodles. Leanne Vogel: They look like fettuccine? Yeah. Fettuccine. Kevin Kraft: Yeah. That looks really interesting. I know they taste really great. Leanne Vogel: Kevin loves low carb noodles. They’re his favorite things. Kevin Kraft: Yeah. 2 grams, 2 grams of carbs. Leanne Vogel: Yeah. For the whole bag? Kevin Kraft: I like that. Well, obviously I would eat the whole bag, because they taste good. Leanne Vogel: Yeah. They are pretty good. Oh. Poor little snuzzpot. Kevin Kraft: Purified water. What’s this? Leanne Vogel: Yeah. That’s fair. Kevin Kraft: It sounds like alcohol. Leanne Vogel: And calcium hydroxide. Not like you care, but you just put water on top of it and strain it. That’s why I just bought a new strainer, for these noodles specifically. Kevin Kraft: They’re funny though. It says, “Store unopened packages in a cool and dry place.” Well, they shouldn’t remain unopened. They should be opened and eaten. Kevin Kraft: Come on, here. Leanne Vogel: Anything else? Is there anything else, or was that it? Kevin Kraft: No. No. Oh. We got another package. Leanne Vogel: Oh. We got two packages. Kevin Kraft: What’s this? Thrive Market lavender essential oil. Leanne Vogel: Guess where we’re putting that? Kevin Kraft: It smells good. Leanne Vogel: We have a little smelly thing that releases essential oils into the air, but it’s really loud. Leanne Vogel: And it drives us both crazy, but we love it so much. I think that’s all. Kevin Kraft: Where’s the rest? This is fun. Leanne Vogel: That’s it. Sorry. This is fun? Okay. That Thrive Box was $68.82. I calculated it all out. But basically free if you go to ThriveMarket.com/keto, because you get $20 off your first three orders, which is a total win. Again, that’s ThriveMarket.com/Keto. I’ll include a link to this magic-ness in the show notes, so you can get that $20 off your first three orders. More on Kevin and me after this message from one of our podcast partners. Okay. Now we get into the section of the show on being keto. Okay. How would you each describe the difference between your keto style? Kevin Kraft: I think I’m a purist in a way. Leanne Vogel: Kevin is totally a purist. Kevin Kraft: I was going to say I do like the occasional carb up, but then I eat carbs like every two weeks or so, whatever it is, and then I don’t feel so good. It doesn’t matter what carbs I eat. It’s funny, because I’m like, “Oh. You know what? I should really have a pizza or have something else that’s more healthier maybe.” I get carbs and I’m like, “Oh. I don’t feel so good.” For me, it’s much simpler, because I’m like, hey, no carbs. No carbs. No carbs. No carbs. Leanne Vogel: Well, you eat a lot more raw vegetables than I do. You eat raw vegetables, but you don’t like cooked vegetables. Kevin Kraft: No. I don’t understand cooked vegetables. If you cook vegetables, all the good stuff is dead. Leanne Vogel: I think you could do the carnivore diet easily. I think that you would thrive on the carnivore diet, guaranteed. Leanne Vogel: Basically all you do is eat meat. Kevin Kraft: Oh. Yeah. I like it. Leanne Vogel: Then whereas with myself there are times where I can’t even comprehend how much meat, especially beef, Kevin is able to eat. I do not feel good on eating that much beef. I go in and out of it. Sometimes it’s more pork than chicken, but when I was healing my hormones, I couldn’t get enough beef. Do you remember how much beef I would eat? At least three pounds a day. Now it’s like, “Bleh. I can’t.” I can eat beef maybe twice a week. That does affect with my ketones. Sometimes I feel like I’m in keto more so when I listen to my body than when I don’t and I eat things that I think I should be eating, but I shouldn’t actually. I guess what I’m saying is when I listen to my body, I’m so much more able to make conscious decisions that make me feel better as a result, especially when it comes to my ketones. It blows my mind how long you’re able to go without carbs. Then also, when you do a carb up, it is epic. You’re getting ice cream, and popcorn, and ordering pizza, and you just keep eating. Then you don’t eat all day the next day. You don’t eat at all the next day. Kevin Kraft: Well, isn’t that how it’s supposed to work? Kevin Kraft: Doesn’t that reset your satiating hormone? Oh yeah. Leanne Vogel: Learning. Learning from the best. I think that’s kind of the difference is that Kevin has a lot less carb ups, but when he carbs up, it’s epic, whereas I have little ones like once a week. Once every couple of weeks, he just does this massive load. He eats a lot more meat, whereas I don’t, and he eats a lot more animal based fats than I do, because I eat more vegetables and stuff. I put more olive oil, coconut oil on that, whereas Kevin gets most of his fat from meat. Oh. And avocado oil mayo. He eats a lot of avocado oil mayo. Kevin Kraft: That’s so hard to find though. Then I go to Costco, and I find this avocado mayo made by some big company. Then I read the back, and there’s almost no avocado in it. There’s a bunch of other stuff in it. That’s another deceiving thing that is really frustrating when you see a package. You really got to read the back and the ingredients. Leanne Vogel: Okay. Testing ketones. Kevin Kraft: You know what? I was really excited about it, probably because of tech. I like the technology behind it, and I like numbers, but it’s kind of annoying. I find that if I just eat keto, I don’t really need to test. The ketones are what they are. Leanne Vogel: Yeah. You just feel good. You either feel good, or you don’t feel good. Why do you obsess about this? Kevin Kraft: Yeah. You know what a really easy test is? Just go to any place and have … For your carb up go to a place you know that has bad oils or something like that and have fries. Then everything starts hurting, and you get a headache. Then you know, it’s like, “You know what? This is not good for me. I need high quality foods, and I don’t like carbs.” I don’t know. That’s a good test. Leanne Vogel: Yeah. Let’s not complicate it. Kevin Kraft: Yeah. Sorry. Yeah. I was really excited about testing it. Leanne Vogel: I remember. You were super stoked. You were like, “I’m going to get the urine strips, and the blood strips. I’m going to do the breath. It’s going to be great.” You did it like once I think. Maybe twice? Kevin Kraft: No. I did it more than that. Leanne Vogel: Did you? Oh. Kevin Kraft: I created a spreadsheet for it too. Leanne Vogel: Oh. You did. I totally forgot about this. But then you got really disheartened when you were testing, and the numbers weren’t great, but you were feeling good, and you got really discouraged. Kevin Kraft: Yeah. I think that’s one of the reasons why I would … If somebody were to ask me if they should test their ketones, I would say no. I know it’s probably not … Again, I’m not Leanne. I’m just a dude, but I would say no, because it’s really discouraging when you try to eat a certain way and try to follow something, and you think you’re doing everything right, and then your ketones are doing something weird, and you don’t have … I mean, for me it’s a little bit easier, because I can ask Leanne, but there’s so much conflicting information out there, other than on Healthful Pursuit, obviously. I don’t know. I would say don’t do it. Kevin Kraft: I guess it goes back to the same thing. Not every person is the same, and keto can work one way for one person and another way for another person. Leanne Vogel: Okay. The next question from you guys for the two of us was dealing with frustration. Did you ever feel frustrated because your results differed from one another? If so, how did you deal with that? Leanne Vogel: It felt like a lot. Kevin Kraft: Well, the appearance. My face got leaned out, and certain … Yeah. Leanne Vogel: There are days where I am a little bit jealous that you’re able to eat keto all the time and feel great, like the way that you do, whereas my body’s just different, and it’s constantly changing. My hormones are in a really, really, really good place now and ovulating with the moon and things like that. It’s so cool, but I find, even throughout my cycle, I just can’t keep up. It’s just different, and that sometimes frustrates me, but also makes me really interested in all of it, you know, of just how our bodies are different, male and female, and even there are couples out there where they both eat the same ketogenic diet, and they thrive on it. That blows my mind. It’s just so different. So, I think it’s such an individual thing. I just know with my body something that frustrates me a lot is like … Well, I wouldn’t say it frustrates me. It’s just something that I’ve always had a hard time accepting is my body needs to carry more weight than what I probably perceive as looking great. You know what I mean? I need to carry more weight in order for my hormones to be balanced. The minute I go under five pounds of where I’m at right now, I lose my period, like it’s gone. Kevin Kraft: Well, I think it goes back to there is different reasons why a person would choose to do keto, and I think our main goal is to be healthy. It doesn’t mean you can’t lose weight, and do keto, and be healthy, and all of that. I think for us it’s just about being healthy, and it just is what it is. Our keto approach is what it is. Leanne Vogel: Yeah. It totally is. Kevin Kraft: Even if we were to try to get frustrated, what are we supposed to do about it? Leanne Vogel: Yeah. I guess we just both go off of what makes us feel good, and when we don’t feel good, we’re like, “What did we do to not feel good, and let’s not do that again, or be mindful of it for next time.” Easy peasy. Okay. Listening to your body. Leanne is pretty in tune with her body. Were you able to tune in and listen to your body as well, Kevin? Leanne Vogel: I think you’re totally right. I’m freakishly in tune with my body. It’s kind of terrifying. Kevin Kraft: Yeah. But it makes you a bit of a scientific machine in a way. Also, it’s happened over many years. Leanne Vogel: Yeah. I wasn’t like this even when we first met. I was not like this at all. I would have those debilitating … Remember those stomach pains I would get? I’d have to lay on the floor, and I was in tears. It was horrible, I had no idea what was going on. Now, it’s totally because I ate popcorn every night and stressed out a bunch. I only ate carbs. That’s all I ate was sweet potato fries and popcorn. Kevin Kraft: But they were organic. Leanne Vogel: They were organic sweet potatoes and organic popcorn, and I even put organic coconut oil on that, so I was the best vegan ever. Yeah. Then if you had to describe how to listen to your body to somebody who doesn’t believe in that or doesn’t know how, what would you say? How would I describe that? Leanne Vogel: A question for Kevin was what was the hardest thing to give up on keto, and did you actually go cold turkey? Yeah. You went cold turkey. You were just like, “Okay. Doing this keto thing.” Did you find anything challenging? Kevin Kraft: No. I don’t think so. I did give up Kit-Kat bars. That was really the only treat that I had, but I don’t find it difficult at all. I think that goes back to, and Leanne, correct me if I’m wrong, about how our body starts craving the things it actually needs. Before that, it was carbs, because I was living off carbs. Now it’s like, “Hey. You don’t need this stuff anymore,” so I can walk past a box of donuts or Kit-Kat bars. We were on a flight once and they were handing out full size Kit-Kat bars, and I couldn’t care less. I genuinely just didn’t care. Leanne Vogel: That was a big moment. That was a big moment. That was probably about four months after you start eating keto. It was at the end of the … Well, I don’t even think it was four months. It was maybe a couple of weeks, because it was our last flight of the book tour, and we got upgraded to business class, which was so great, for free. It was like a hurrah for the book. Yeah. You just were like, “No. Thank you,” and that was a big moment. Okay. The next question was, Kevin, do you fast? What were your original opinions on fasting, and has that changed at all? Leanne Vogel: No. Never. Never. You’re kind of a breakfast guy. You love your meat and eggs in the morning. I would say that I probably fast a little bit more than you do. You fast after your carb ups, like the whole day often, but it’s usually that I make you eggs with some sort of meat and vegetables every morning, unless we’re driving, or busy, or like book tour stuff. We never ate breakfast, or we’d have just bacon or something, if we could, but I think for Kevin I feel like it’s more of a psychological thing with you of breakfast and your coffee, and you just like it. You’re a better human when you have those things. Kevin Kraft: Yeah. I think you’re probably right. Leanne Vogel: It’s that ritual that you like. Leanne Vogel: Whereas me, I love the freedom of finally being able to be like, “No. I don’t want breakfast,” and I don’t like breakfast. I’m not a breakfast person. I would rather eat at night. I love eating at night. That is my favorite thing in the world, other than my husband. Okay. Going back to carbs. This is the last question for this episode. Do either of you ever see yourselves going back to eating the way that you were before or the way that you ate before? Kevin Kraft: I don’t think I have a reason to. Leanne Vogel: No. Why? I never say never, because you don’t know what’s going to happen. I don’t know if I’ll ever go back to not being connected to my body in that way, and keto’s really allowed me this ability. Leanne Vogel: Maybe if we lived on a boat and we couldn’t get meat, so we started eating more fish and produce or something. I don’t know. I just feel like I wouldn’t thrive on that eating style. Leanne Vogel: And we travel full time, and we’ve been fine so far. I don’t know. Never say never, because you never know where your body’s going to take you and what’s going to happen, but I think the momentous changes I’ve seen in both Kevin and myself, just us personally and how different we are eating this way, I don’t know what would need to happen in order for me to change it. It’s been life changing. Why would you stop doing that? Right? Why? Why would you stop doing that if you feel really good? I guess the key is as long as you feel good, keep doing that one thing. Kevin Kraft: You know what was really difficult when I was working still in an office? Kevin Kraft: Going out for lunch, and everybody was like, “Why are you eating that?”, or, “It’s not that bad,” and things like that, it didn’t get to me, but it really annoying. It was annoying to a point where I was ready to tell people to go, leave me alone, and go take a hike, because it makes it a lot more difficult. Kevin Kraft: Yeah. I mean, I still wouldn’t change the way I eat because of that, but that was really hard. It was more of a hurdle for me to get going with keto, as opposed to it maybe stopping me from eating keto. Leanne Vogel: There you have it, our first podcast episode with Kevin. I hope you guys enjoyed it. We tried to answer all of your questions, as it related to us and all of the things that we struggled with and experienced when I went keto, Kevin went keto, we’re keto together. 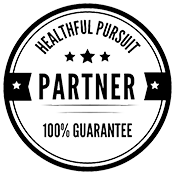 I think to bring it all together perhaps we just chat quickly about the easiest way to convert a family member to keto. If it wasn’t clear throughout the entire episode, it’s really that you can’t convert them. The only way to “convert them,” is to just do your thing, and be happy, and allow your eating style to guide you in different directions, and do your research, and find really great resources out there to kind of latch onto, and get that community going of maybe it’s a Facebook group. Maybe it’s Instagram. Maybe it’s meet ups in person or just something. When your partner, significant other, friends start to see the change in you, they will ask you. The ones that are ready for change will ask you. That goes for anything. That’s how Healthful Pursuit got started. We don’t go out there and shove keto down people’s throats. If you want to be with us, then you’re there, and we’re sharing information together. It’s the same thing, it’s the same thing. I never once tried to convert Kevin. I knew that he would thrive on this diet, and I knew that if it was right for him, and it felt right for him, and if at some point he wanted to do it, he would do it, and I would be there to support him. Otherwise, I would continue to just buy healthy foods where I could and try to push different types of foods on … not even push, but just bring them into the house, incorporate them. He hates eggplant, so we won’t do that again, but just constantly incorporating different things. Kevin Kraft: I think the only thing I would say is know more about the ketogenic diet and how it works. I mean, don’t tell people that’s why they should switch over to the ketogenic diet, but just knowing about the keto diet, so that when somebody does have a question about it, you can answer it, or you can even say, “Hey, the ketogenic diet does this or that.” I don’t know. I think that could help. Leanne Vogel: Or you could just tell them to go the HealthfulPursuit.com. No. I’m just kidding. But just duh. Leanne Vogel: Cool. Well, thanks so much for hanging out with us, guys. This was really fun. The show notes and full transcript for today’s episode can be found at HealthfulPursuit.com/Podcast/e77, and we’ll see you guys next Sunday.